This book has 584 pages of Beach Volleyball stories and anecdotes, including some of the most noteworthy event in the history of the game. Volume #2 "takes-off" where Volume #1 "left-off" continuing with the stories, events and tournament results from 1970 through 1989. 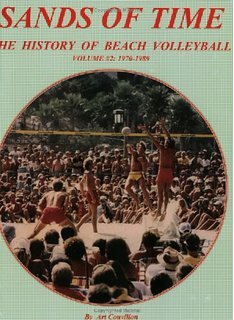 The book includes 1200 classic and rare, some never before seen, photo's of the events, venues, characters, players and legends of Beach Volleyball. This book has the most comprehensive Beach Volleyball tournament results ever compiled. Volume #2 of "Sands of Time" moves on from the "Adolescent Years" of the 1960's into the "Spirited Years" of the 1970's and through the "Transitional Years" of the 1980's.